My traditional publisher won’t promote my book! What’s an easy, affordable way to do it myself? In 2002, my book was published by (a traditional publisher). It’s a book on creative writing for teachers. I don’t think the publisher could afford marketing and I did not have time with my job at a museum. Any ideas for how to promote? A book’s sales potential depends entirely on: 1. the book itself; and 2. the authors’ marketing savvy and efforts. Just listing a book on a particular website like Amazon or Barnes and Noble, or even having your book in the bookstore systems, won’t generate sales. Unfortunately, that’s all many traditional publishers do now. 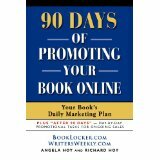 The author must promote the book in order for it to be successful. This is true for self-published and traditionally published titles. Traditional publishers do little to no promotion for unknown/new authors now. They take a gamble that a book may or may not take off and they run with the ones that do, while generally abandoning the ones that don’t. Of course, the ones that do succeed are usually written by well-known authors, or are the ones being creatively and consistently promoted. One Response to "My traditional publisher won’t promote my book! What’s an easy, affordable way to do it myself?" This book is a jewel!!! I have read, and reread, underlined and highlighted, and am now setting up my “Book Marketing Cheat Sheet! Great advice not only for writers, but also for artists and any other entrepreneur looking to promote their business.